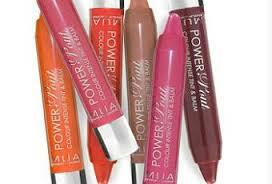 If you read my blog regularly you'll know I'm a big fan of MUA, especially their lip products. I was browsing the superdrug website to look at some of their lipsticks when I came across their Power Pouts. The reminded so much of Clinique's Chubby Sticks. I just couldn't resist them so I bought two as they were on a buy 2 for 4 pounds offer and they're 3 pounds each so that's a pretty good deal (yes - I sound like a shopaholic)! As they were quite cheap, as MUA's products usually are, I didn't expect them to last longer than MUA's normal lipsticks which only last about an hour and a half so when I wore them out I was surprised to look in the mirror after 5 hours of shopping and find the colour still there. Let me tell you - it was a pleasant surprise. These Power Pouts also have a really nice smell. I placed it the other day as it smelling like watermelon, don't ask me why! As I said before, I bought two of them and these colours were Broken Hearted and Crazy In Love. Broken Hearted is a fun pink colour. It's not super bright but it brings a nice vibrant pink colour to your lips. I love it because you can wear it out shopping or to lunch and it looks really nice yet not over to top. I chose Crazy In Love because I wanted a going out lipstick, but I didn't want a bright red because that's what a lot of people wear and I fancied something different. Crazy In Love is a bit of a pink and red mix. It's great if you're wearing an outfit which consists of mainly dark colours. I took some really good pictures of these lipsticks on, but for some reason blogger won't let me which is annoying! I'll try and post them as soon as I can figure out what the problem is. I honestly love these and they are so easy to apply! Much easier then a normal lipstick! I'll defiantly be buying other colours in the future! Thank you so much for reading! I hope you all found this helpful. Feel free to leave a comment as I love hearing from you all and please share this post if you liked it! Thank you! I know, I love them more than proper lipsticks! Going to be buying these for a long time! Barry M Glitter Nail Paint Review!